How you price your art is changing. How does what you do fit with what other people are doing? This page looks at how artists price their art - in terms of responses to polls I've been running on this topic since 2009. How do you price your art in 2018? POLL: WHAT INFLUENCES HOW YOU PRICE YOUR ART? POLL: WHERE DO YOU EXHIBIT YOUR PRICES? 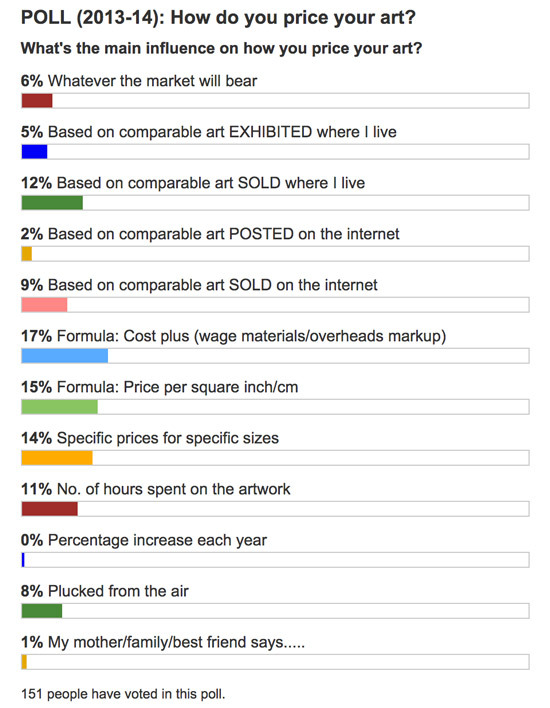 In 2009, I conducted a poll about how artists priced their art on my blog (see chart). What type of art they produced was of less important to what type of approach they used for pricing their drawings and paintings. What this says to me is that artists tried very hard to be consistent in their pricing - in relation to size and place where it is sold. You can read more about the poll in Results of "How do you price your art?" In 2013/14 I ran the poll again and got slightly different results ( see chart). This time 151 people took part in the poll. It seems as if artists were getting better at understanding their input costs and overheads. The artist studies prices displayed in local galleries and other places where art is sold and finds a comparable artist in terms of media and/or subject matter and relates prices to these. This is an increasingly a popular option. Artists now seem to recognise that they MUST know what artwork sells for in their local area. The artist determines an hourly rate for their work, adds in the cost of materials (and matting and framing if applicable) and then adds a flat rate or a percentage as a mark-up which covers marketing and other business expenses and/or a profit element. It's maintaining popularity over time - maybe as more artists have become more business-oriented? worth using 'backwards' as it were to see how much you're paying yourself as a wage for your work. Still popular but gradually decreasing in popularity over time. It's sensible if artists work out which sizes sell best BEFORE determining the prices they want to set for different sizes. This then helps an artist to decide how to allocate their time before different sized artwork. The more pieces you produce in the size and price range that has a good track record for sales, the more likely you are to achieve actual sales in reality. A standard price per square inch or centimetre is determined by the artist and this is then applied to all artwork. This option is on the decline. Possibly because it doesn't achieve good business results. The standard price must have some foundation in fact to be work properly. A number of artists commented that size was immaterial - and that in fact it was more difficult and took longer to produce quality artwork in small sizes! rather like providing a quote for painting a room! Breaks the basics of selling artwork down into readable 'chunks'. Includes a chapter about setting prices for original artwork. The options with the fewest votes might be deemed least popular. But are they? This approach is often used by an emerging artist who wants to grow sales income over time. The emphasis is always on relating to prices charged in previous years rather than what the market will bear or is currently paying for comparable work or input costs. least popular option - but that might be because if was seen as a refinement of one of the others which formed the basic approach. In 2014, nobody was using this method. Given the recession post 2008 this is hardly surprising given that inflation in a number of countries was running at a low level. BASED ON COMPARABLE ART ON THE INTERNET - DECREASING / UNPOPULAR? The artist looks at what else is available on the Internet and picks an artist or group of artists, notes the prices asked (or achieved at auction) and then adjusts accordingly. The two options in the middle of the pack are based on gut feel - and some research. The price is determined by a calculated hourly rate based on the notion that materials costs are incidental and the crucial cost driver is the number of hours required to complete the work. In theory it seems to have a rationale - but should the price of artwork really depend on how long it takes to paint? It bears no relation whatsoever to whether or not the market will pay the price. It seems to contradict sound business practice i.e. more astute artists realise that time has an opportunity cost and work out ways to speed up their art-making while not losing quality e.g. simple things like gessoing 20 boards of a standard size in one go. Or even better get your studio assistant (spouse, partner or responsible child) to do it for you - for love! Artists did confess to feeling guilty for charging high prices - and getting sales - for artwork which didn't take long to do. To which my response is to ask how long have you spent working at your art so that you can work quickly and with skill? This is the "it feels like a $500 painting to me" approach. It's often used by those who want to avoid doing any research to check out the current state of the marketplace. However I've used this one from time to time and my guess is most people probably have at one time or another. can work if you look at a lot of art and a lot of prices - and get a feel for the market and the art. In effect it's what dealers do! learn how prices vary between different marketplaces, galleries and other places for selling art. What I do is go and see exhibitions and collect exhibition catalogues! I make notes about what work sells and what the price thresholds for sales of different sizes of work seem to be. The best time to do this is just before an exhibition finishes as it provides a snapshot of how the market is working. 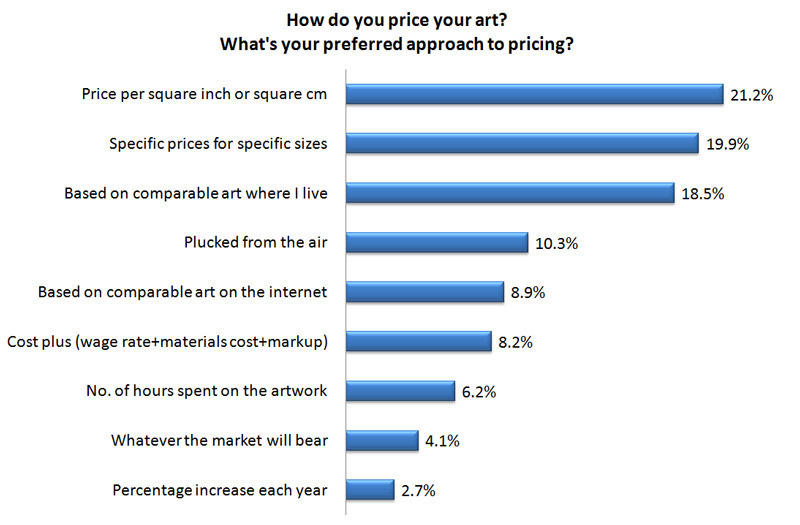 Artists participating in the survey also identified other ways of pricing art. If the artist likes a piece a lot then it has to have a high enough price which would make a sale worthwhile!